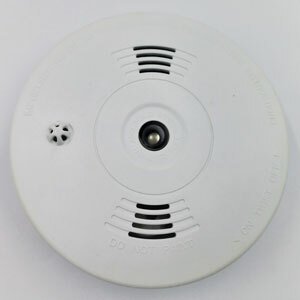 AS-753R wireless photoelectric smoke heat detector is a photoelectric smoke and heat detector, here in after called detector. With a unique structure design and an intelligent MCU to process photoelectric signals, it is provided with dust-proof, mothproof and anti-light interference etc. functions, ensuring the detector stability from design basis. It reacts very quick to visible smoke released by smoldering fire and flaming fire. It has photoelectric smoke sensor and heat sensor inside, the detector will alarm when the temperature up to 57℃ or the smoke reach the alarm level. It’s suitable for fire alarm in house, factories, shopping malls, hotels, restaurants, office buildings, teaching buildings, banks, libraries, warehouses, etc. This detector adopts the principle of smoke particles reflecting infrared lights. The main circuit includes a MCU processing part, an infrared emission part and an infrared reception part. The emission and reception diodes are placed in the optical maze chamber which can shield the interference of outside stray lights, but will not influence smoke entering into the detector. On smokeless conditions, the received infrared lights are very weak. When smoke entering, due to scattering effects, the received light signals increase. When smoke density accumulates up and reach the alarm threshold of the MCU, the detector will blink its alarm indicator, give out strident alarm sound and send out alarm signal to the networking alarm system.